Here we are a brand new month. One that brings in gatherings of friends and family celebrating thankfulness of harvest--heck we are talking pumpkin time. I like just about anything pumpkin! From the color orange to carving them for Halloween. From pumpkin cheese cake at Claim Jumper to the delicious pumpkin muffins that Mimi's serves up. I must not forget to mention the great bagels at Bruggers. Oh my, can you tell I love pumpkin? I had so much fun serving the Trick or Treaters last night. One of the more clever was an I-Pod! Of course nothing like the princesses, Supermans, and Spidermans. Not many witches or warlocks came knocking at my door, but I did have a gorilla. We had just enough candy to go around--which is a good thing for our waist lines. I spent the better part of Sunday working on Kreamed Korn in between the usual weekly chores, lunch and dinner making along with the clean up of the kitchen afterwards. Komotion and Kaos had their nails trimmed as wells as their usual Sunday combing. It was a beautiful day that I started off with a brisk morning walk. The weather is just perfect. Kreamed Korn is coming along nicely. I have most of it together; what remains is the assembly of the major block. I have a few more oranges to locate still. 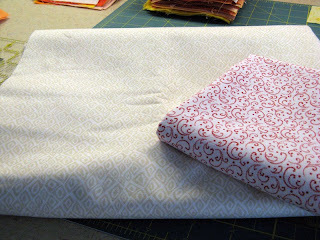 I did find two potential light border fabrics which I plan to audition once the layout is determined. I still have a dark border and binding to find along with the backing. So here's a sample of what's happening with my project. Check out other Design Walls by going to www.patchworktimes.com. It's a beautiful day in San Diego. The weather folks called it right; Mother Nature cooperated to give us nice weather for the ghouls and goblins that will grace our doors later this evening looking for treats (or beware if they find none--tricks might be served instead)! We've got our witches cauldron of Hershey candy ready. Of course we've selected everything we like in the just right snack size in case there are leftovers! I love being home to pass out treats to all the kids. I'll admit that sometimes I'm not quite sure and end up having to ask "What Are You"? I accepted the generosity of Memory Lane Quilt Shop in Santee with a gift of 25% an item during my birthday month. Well Bonnie Hunter says its a legal to purchase to get neutrals anytime...so no additional encouragement was needed on my behalf. I found this nice one that I brought home 3 yards of yesterday. I also have the last 2010 UFO to finish that will use mostly stash, but I will need a few white with red backgrounds to give me enough for the project. Add to my 3 yard purchase another 1/2 yard. Not really too bad, but you know I thought about reporting a purchase today. I've been working on Kreamed Korn this week. 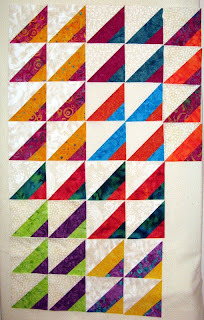 I've got all the pieced border blocks done as well as most of the other three blocks that make up the main block. I will finish them up in the next day or so and start laying out the pieces to determine what colors look best where. 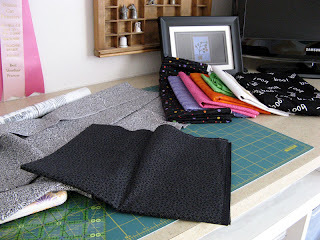 I will also start looking through my stash for yardage for the solid borders of which there are four. Three are light and one is dark. I'll use a dark for the binding. During this scouting what to use for the back comes into play too. 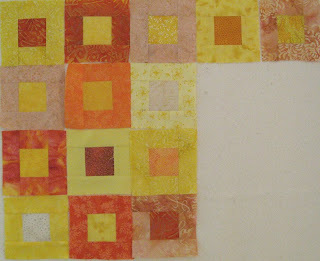 I don't have enough ecru, yellow or orange to put together the approximately 72 10 1/2" squares that will be needed. Hmmm...what can I find. 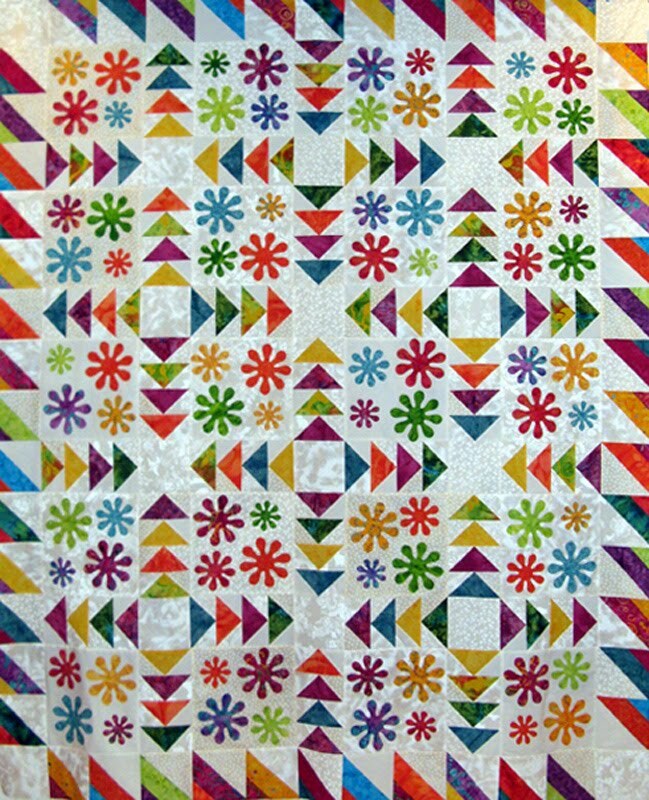 I also fixed Kollette and added to Kerry's Quilting queue. I'll selected parchment colored thread and a quilting pattern called Paradise. 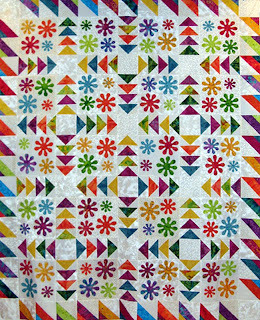 Can't wait to get started with Bonnie Hunters Mystery Quilt Project that starts tomorrow called Roll, Roll, Cotton Bol. Yardage requirements first with the first clue out on November 19th. Enjoy the rest of what's left of October; Novmeber is upon us. So my numbers for this Spooky Day. It's the middle of the week today. San Diego started getting back to it's normal weather, but towards the end of the week I'm hearing it will be back to rain. We need every bit Mother Nature can give us this time of year. I suppose we should be thankful :(. I sure hope for the Trick or Treaters that it is dry on Sunday evening for this annual event. 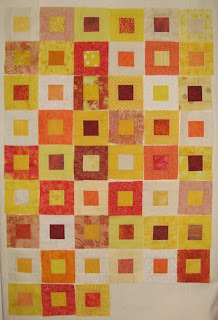 This is Shelly's 2010 Block Exchange project. This one was a challenge with the curved piecing in the center. I'm anxious to see how the other color ways turn out as well as Shelly's finished project. This is just one piece of the master piece I'm sure she'll create. 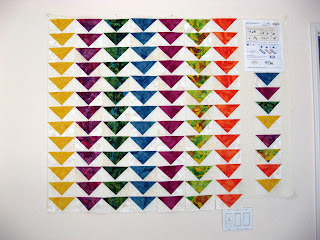 Finally, Kollette complete and ready for quilting. I'll be selecting a dense all over quilting pattern in a thread color yet to be decided upon. Kreamed Korn is on my sewing table. I've got several more border blocks that need to be finished yet. I do like what I'm seeing so far. I'll be cutting more 2 1/2' and 1 1/2" strips since I need loads more to finish the 30 main blocks that make up the quilts center. I'll be working on these steps the rest of the week and throughout the weekend. This week is an Off Friday for me and that means an extra full day of sewing! Hope you have some accomplishments this week. Here we go the start of another week...the last full one of October 2010! Imagine...just 10 weeks until 2011 rings in. Where has 2010 gone? On my wall today is Judy's Peaches and Dreams pattern. As I mentioned yesterday no name has set in for this one yet. I've been working on the border blocks. That's what I'm showing you...today I'll spend time during my lunch break cutting some 2 1/2" by 8 1/2" strips of orange, ecru, and yellow for the larger of the four components that make up the 12" main block. I think I'll make my quilt 5 by 6 blocks like Judy's pattern, but shorten it up a bit with only one border after the pieced border. I do like the orientation that the 5 by 6 blocks presents. This project is going together fast! Kollette is in it's final stages of assembly today. I'll have it all together sometime this afternoon. So I'll post yardage used in this week's report. I'll be posting a photo soon for this spring like beauty. 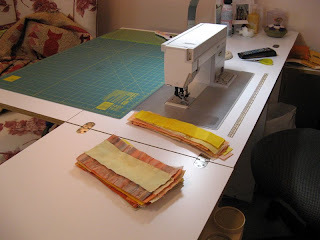 I sewed as much as I could on Shelly's 2010 Exchange Block for BAE Systems Quilters. I mentioned in an earlier post the pattern Mississippi Wheel of Fortune that she'll have us each make. The next step of assembly involves a template that unfortunately is at work. The template has markings that are significant when sewing the curved middle portion of the block. The blue and yellow curved pieces will go in the center of the "wheel" and the orange will be the middle. The green/green pinwheel points get cut away. Perhaps you can make it out in the instructions photo. Kreepy (my Any Witch Way project) is finished and ready for Kerry's Quilting queue. (Sue made the suggestion of calling it Kroones...what do you think?) It was fun working on this project with my Mom. I think Mom did a better job on her witches' eyes, although mine didn't come out too bad. Kerry had a kit to take with her this weekend when she visited her Mom; I wonder if she was able to finish hers. My next project is one designed by Judy Laquidara called Peaches and Dreams. 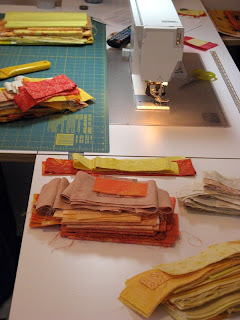 I've been gathering my orange, yellow, and ecru strips as well as cutting some more for my quilt. I'm starting first on the border blocks. I'm only 14 blocks into the 78 that are needed for the huge 92" x 104" quilt. I'm thinking to make this one smaller. Judy has been wonderful to describe how to easily achieve this. Of course I'm already starting to figure out a "K" name. My thoughts so far are Kantalope and Kream, Kreamed Korn, Kustard, and Kreamsicle. I'll have to see what color stands out to help me decide on a name.. Kreamed Korn is winning at the moment. Here's my report for this "finally" not rainy day in San Diego. Step 3 is done! This is just part of the blocks from Step 3. I've pictured all the different colored options that I'll get to arrange with the other two steps. Now all three steps are done. 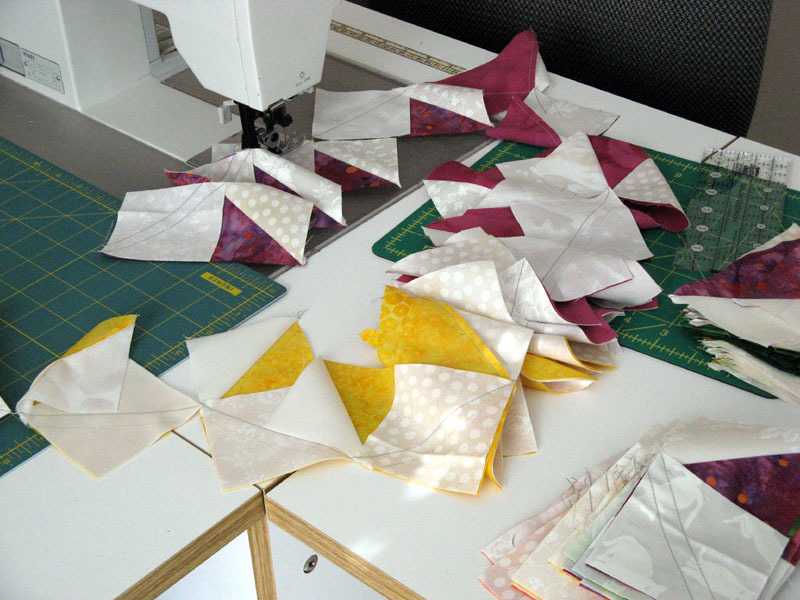 20 applique flower blocks from Step 1, 31 flying geese blocks from Step 2, and the 50 strip blocks from Step 3. I've not spent much time arranging yet, but will get to it the later part of the week. There are nine rows with the quilt finishing at 65" x 80". I just may have a finished top on Sunday! Kollette sure is looking pretty. It's back to the design wall for me. Assembly should go fast. I'm thinking of a dense all over quilting stitch. An off white thread will probably be my choice as I've got an off white backing. 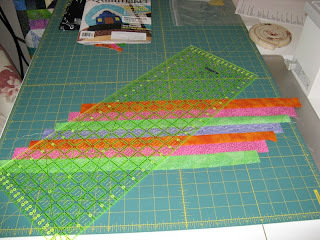 The lime green Batik is what was provided in the kit for the binding which works for me. This was a fun project and my last of five 2010 UFO Patterns. Already starting to think of what's next to work on. Here's my Design Wall for today. Another rainy day in San Diego. Weather forecasts call for this condition all week--yuck! Step 1 of Kollette is well on its way. 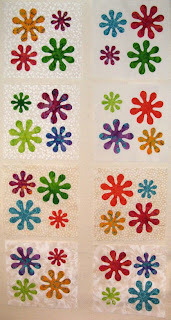 I've got to make a few more of these fused flower blocks and then it will be on to Step 3. Step 2 is complete. I was able to sew four exchange blocks and the three Any Witch Way kits have been assembled (Mom's is finished to the quilting). This yardage will all be claimed this Sunday. Let me show you some pictures... 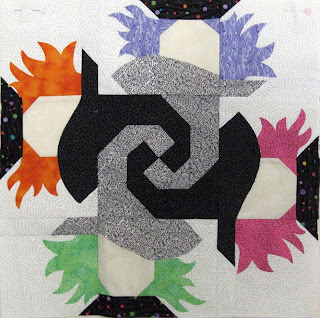 This one is Sue's 2010 Block Exchange with BAE Systems Quilters. 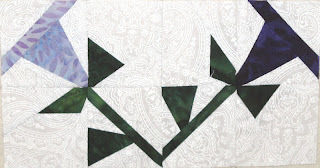 A paper pieced Morning Glory from a free pattern she wanted us to make for her. It can be found at http://www.winnowing.com/corning.html. 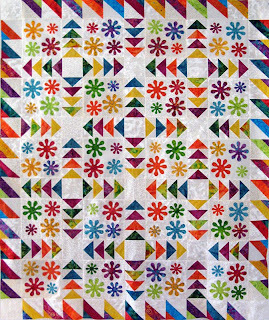 It is a 4" block that will be added to a 2010 Row Quilt Exchange that she did with Sunshine Quilt Guild. 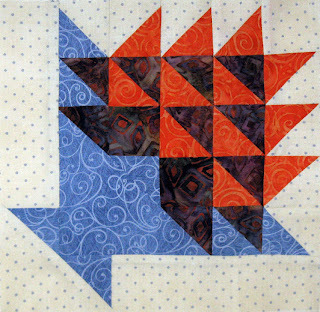 This block is the Maple Leaf block from the Scattered Leaves pattern in the October 2009 American Patchwork and Quilting magazine. 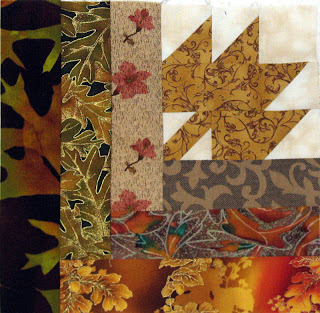 Carol organized this October 2010 Sunshine Quilters Guild BOM Exchange. 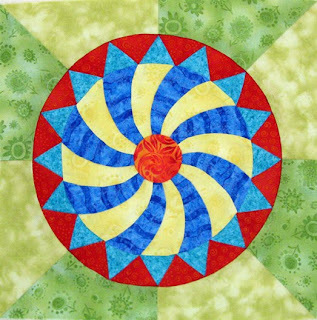 This block is the Pinwheel block from the Windblown Posies quilt pattern by Pat Sloan introducing the Chelsea Lane fabric collection by and Textiles. It is also a free pattern. 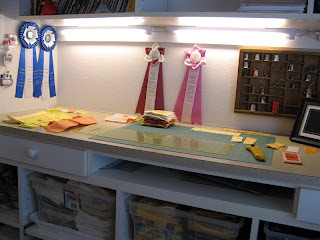 Peg organized this November 2010 Sunshine Quilters Guild BOM Exchange. 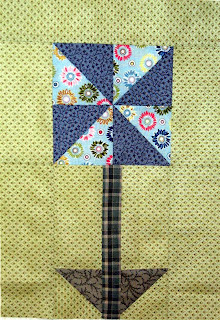 The final block I finished is a block from the Inching Along pattern by Lynda Milligan and Nancy Smith featured in the November/December 2008 Quiltmaker Magazine. It's been made for Christie who is the exiting President from Canyon Quilters. Members who participate are to make a basket block in the bold end of the French color spectrum. Today my home has been pretty quiet. My parents left yesterday morning after a fabulous visit. Wish that they could have stayed longer; hopefully the next trip for the both of them won't be as long as the gap was before this trip. 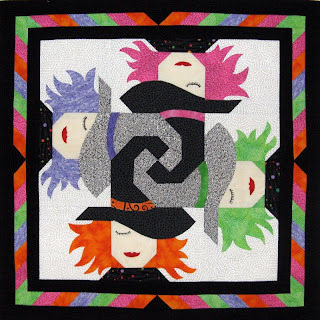 Here's Mom's finished Any Witch Way from the Quiltmaker Magazine Sep/Oct 2009 issue. There were many firsts for her with this project. 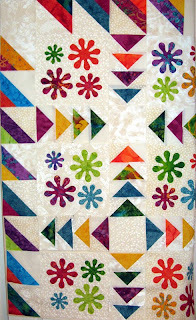 A mitered seam on the pieced border was the biggest challenge. As you can see she did real well. Her next challenge will be to quilt it. The plan when Mom left was to stipple in matching colored thread the hair, hats, and background. Not sure how the borders will be quilted. I'll look forward to her finish. Now it's on to getting mine done. Since both of these projects came from my stash I'll be claiming the yardage used on both of them this Sunday. I finished the back for Koala so it's ready to get into the quilter's queue. Step 1 of Kollette is on the agenda for tomorrow night. Friday this week is an Off Friday from work where I hope to finish sewing down the sleeve on Kufflinks and put the binding on Katalooche. I've got several blocks for various commitments due in the coming weeks so I plan to get these done this weekend or at least make a big dent in that direction. 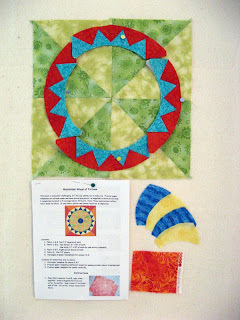 Two are paper pieced, a Morning Glory block (need to make two) and a Mississippi Wheel of Fortune block. Two are pieced, a combination Log Cabin/Maple Leaf block and a Pinwheel block. The last block to make is a Basket. Look for photos on Sunday of what I've been able to accomplish. Think I've got my weekend packed? Hope you've been having great weather like it's been in San Diego these last few days. We had a nice time Sunday at an Octoberfest Party. There were lots of great things to eat and friends new and renewed to enjoy the time with. The party was in a new home of close friends who have still yet to move in. So it was the first event ever for this beautiful home in La Jolla. Our friends can't wait to move in after being in a very tiny place for the last two years. The party was put on by other friends because it's just what they enjoy putting on this event every year. Boy can they cook! More on Kollette to be posted later. I'll be starting Step 1 which is the machine applique of the flowers a little later this week. 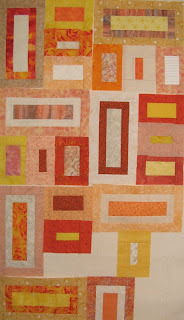 If you have time check out other design walls from some fabulous quilters at http://www.patchworktimes.com/. Been so busy with my parents visit that I lost track of getting my numbers posted. I can't yet report anything used because the two Any Witch Way projects that we've been working on aren't quite done. I'll wait until next week to record the fabric used. It's a good thing I was strong at Cozy Quilt Shop on Saturday or this report would have looked even worse. Time is short for me today too so here's the numbers. This is the center of the first of two of its kind that Mom and I are making during her visit. 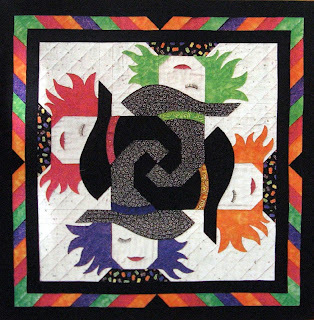 Any Witch Way by Marilyn Larson brought to us by Quiltmaker Magazine Sep/Oct 09. We had a little set back and have to get more Steam A Seam 2. Don't think I recall ever seeing a template presented for applique that was given in the reverse. Guess what I did with the first set of Steam A Seam 2 patches? So until more can be had we moved on to the striped border. We are ready to cut the strip sets into 1 1/2" intervals next...ruler all lined up on the 45' angle. This border is #2 with a total of three; the other two are solid black also 1 1/2" wide. Hopefully we'll get done with it sometime today or tomorrow morning. Then it will be on to the second one. Have a wonderful rest of your week. See you back here on Sunday with the Stash Report. Not much change to my design wall except that most of what will be there soon is on my sewing table! Picture is of Kollette in progress. These are all the flying geese being sewn, assembly style of course. 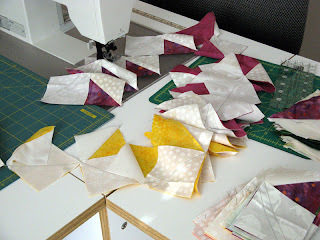 I am excited about the extra half square triangles that I'm going to end up with. I'll have 248 2 1/2" half square triangles to put into some future project. There are two other steps that remain in this project. The flying geese is Step 2. 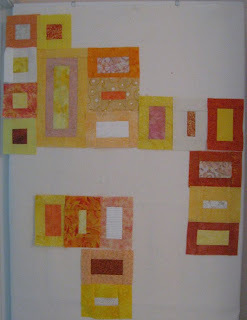 Steps 1 and 3 are machine applique and a stripy block border. I'm going to work on half of Step 1 then complete Step 3 and then go back to the rest of Step 1. You have figured out that Step 1 is the machine applique I'll bet. Find time for what you love this week. Check out the other Design Walls this Monday at http://www.patchworktimes.com/. I am getting ready for my parents visit that begins Tuesday! I've been putting two identical kits together for small Halloween wall hangings that my Mom and I will be making while she is here. Its a Quiltmaker pattern from the Sep/Oct 09 issue called Any Witch Way North and South, East and West. I had to make a very small purchase of three FQs for the "gray" looking witch hats. One would think with all the fabrics I have it would have been easy to pull out a "gray" black and white. Unfortunately this was not to be. I will be needing one "K" name for my quilt. Is there some witch with a "K" or "K sounding" name? If not, I'll come up with something Kreepy. Hmm...maybe that will work. Kollette is continuing a bit slower than I'd like but moving forward nonetheless. More on Kollette tomorrow. This week I look forward to picking up Katalooche from Kerry's Quilting and also dropping Koala off. I'm still working on the binding of Kufflinks the last one I picked up.